Stocks on the Ho Chi Minh Stock Exchange advanced for the fourth day on May 27, but did not surpass 500, as investors were cautious over slumping US stock markets. The benchmark of 230 companies and four mutual funds gained 4.47 points, or 0.91 percent, to close at 497.16. On the index, 135 stocks rose, 51 dropped while 48 remained unchanged. Trading volume remained low with 41.7 million shares being traded valued at VND1.37 trillion. Saigon Securities Inc. (SSI), Vietnam’s largest brokerage, continued to top the list of most active share in volume with 1.69 million shares changing hands. Telecommunication cables producer Viet - Han Corporation (VHG) was next with 1.67 million shares, followed by Vietnam Electricity Construction Joint Stock Corporation (VNE) with 1.46 million shares. Vietnam Mechanization Electrification & Construction JSC (MCG) led the winners on the city bourse today. The company’s shares traded up 4.99 percent to VND42,100. Transport Engineering Construction and Business Investment JSC 584 (NTB) finished 4.98 percent higher than yesterday to VND31,600. The Danang-based Vietnam Electricity Construction Joint Stock Corporation (VNE), Saigon Cable Corporation (CSG), and Gemadept Corporation (GMD) all inched up 4.92 percent to VND19,200, VND12,800, and VND64,000 respectively. Vinpearlland Tourism Joint Stock Company (VPL) lost 32.2 percent to VND28,000 from VND41,300 yesterday. Viet Nhat Seafood Corporation (VNH) dropped by 4.76 percent to VND14,000. Cu Chi Commercial And Industrial Developing Investment JSC (CCI) was traded at VND30,800, down 4.64 percent. 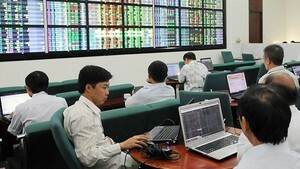 The Hanoi’s HNX-Index surged by 0.35 points, or 0.22 percent, to close at 159.83. Around 31.2 million shares worth more than VND978 billion changed hands. On global market, the Dow Jones Industrial average plunged to below the technical barrier 10,000 points for the first time in four months. The index gave up 69.3 points, or 0.7 percent, to 9,974.45. The Nasdaq Composite index also slid 0.7 percent to 2,195.88 points while S&P 500 index fell 0.6 percent to 1,067.95 points. The Japan’s Nikkei 225 index recovered 0.7 percent from a six month low to close at 9,662.4 points.